here is something that, regretfully, slipped my mind when I was writing last May editorial. 2014 is not only the year that marks the 10th anniversary of "High Fidelity" and one in which Poland celebrates (I do) the 10th anniversary of accession to the European Union. It is also a proud 10th anniversary for Japanese Acrolink, a company that has earned our great respect and to which we have grown attached for years. We came to know its products somewhere around 2009, when the first cables with its logo arrived in Poland. We immediately fell in love with them and started using them in our audio systems, both myself and other members of the Krakow Sonic Society, including our regular host, Janusz. We especially liked Acrolink power cords, starting with the 7N-PC9100 Mexcel, followed by the 7N-PC9300 Mexcel and the latest 7N-PC9500 Mexcel. For a long time our CD players – Janusz’s and mine – had been connected via the flagship 7N-DA6300 Mexcel interconnect, which after years of faithful service was eventually replaced by the much more expensive Siltech Royal Signature Series Double Crown Empress. 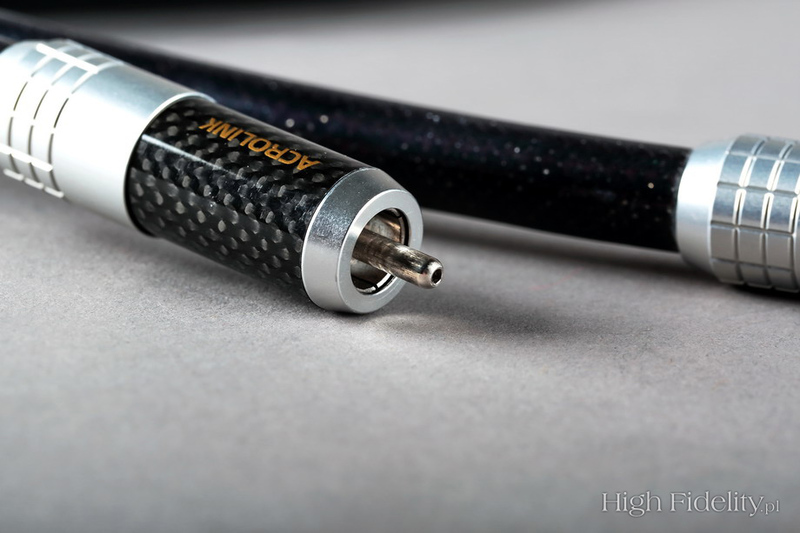 My preamplifier and power amplifier are still linked with one of the few cables in the world that is made of 8N purity copper, the Acrolink 8N-A2080III Evo. Let me also add here that the "High Fidelity" reference audio system has been recently equipped with the 7N-DA6100 Mexcel digital RCA interconnect. In short, we do know and appreciate Acrolink. The cable under review today is an analog interconnect that belongs to the newest generation in the manufacturer’s lineup, which includes analog RCA and XLR interconnects and digital AES/EBU interconnect. 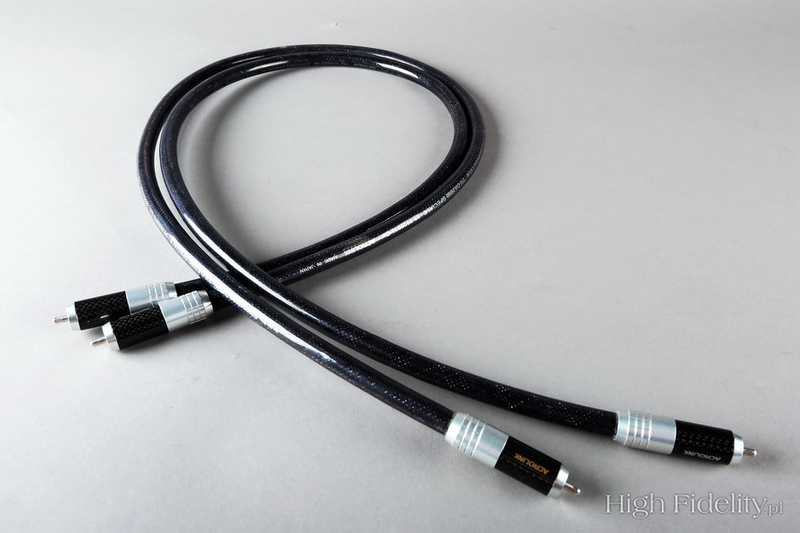 Bear in mind that the first Acrolink cables were based on digital connectors that had been designed to operate in extreme conditions, such as Japanese combat aircraft, U.S. space shuttles and medical equipment. They were manufactured by the giant Mitsubishi Corporation and it was the company engineers, in their spare time audiophiles and music lovers, who were the first to use them in their audio systems. The results of this experiment proved so promising that Mitsubishi created a dedicated subdivision focused on commercializing these, originally industrial, cables. As I said, all of them were designed to transmit digital signals. 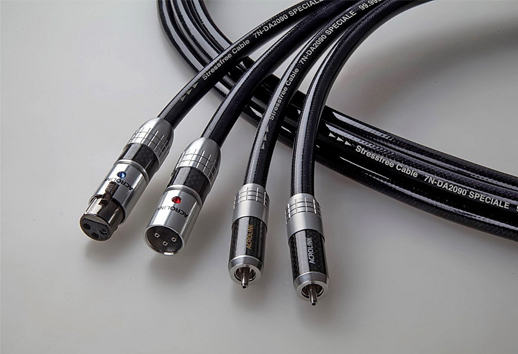 Hence, Acrolink analog interconnects are at the same time digital cables (and vice versa). Different models have either a concentric design, characterized by a 75-ohm impedance (for RCA and BNC S/PDIF connectors), or a balanced design with an impedance of 110 ohm (for AES/EBU). The former are used in analog and digital RCA interconnects while the latter in analog XLR interconnects and digital AES/EBU interconnects. 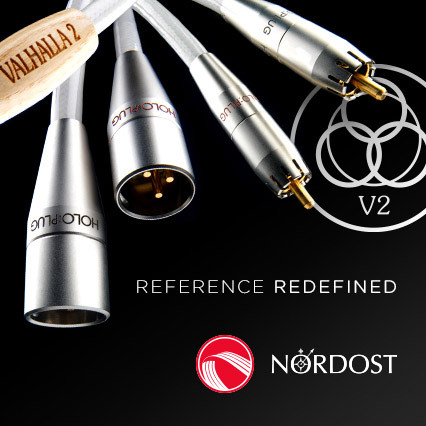 The 7N-DA2090 Speciale is available in two versions, as a balanced XLR and single ended RCA. This is possible due to its design with two conductive cores in a shield. In the XLR version one of the cores carries the positive signal and the other core the negative, while the shield acts as a grounding. The RCA version uses a semi-balanced design, with one core carrying the positive signal, the other one used as the grounding conductor and the shield connected to the ground on the transmitter side. Both versions are directional and use Acrolink’ proprietary high quality connectors. The center (positive) pin in the RCA connector plug is made of beryllium copper (50) with phosphorous copper used for the outer (negative) contact. Both are polished and plated with silver and rhodium. The outer body is made of aluminum alloy, carbon fiber and duralumin. 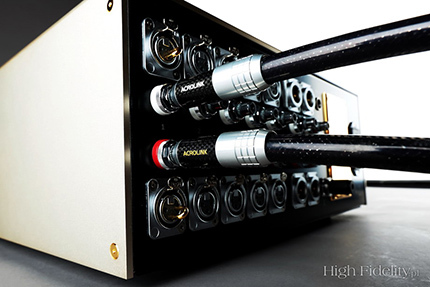 During this review, the interconnect was used in two places: to connect the CD player and phono stage and line preamplifier, replacing the Siltech Double Crown, and to connect the preamplifier and power amplifier, replacing the Acrolink 8N-A2080III Evo. For me, equally interesting to a possible rounding off of a complete cable system with the addition of an anniversary power cord is the company’s choice of the price level for these products. In a similar vein to KEF with the LS50 speaker to celebrate its 50th anniversary, Acrolink now hasn’t launched top "statement" kind of products, choosing instead a pretty high price level yet located well below the middle of its price list, somewhere around a high-end symbolic starting point. In well-organized companies, and Acrolink is run very efficiently, nothing is left to chance or whim but is subordinated to a main idea and current trends in the industry. Hence, the new offer in the form of the 7N-DA2090 Speciale is a product that brings no surprises, from its design through its looks and ending with its price. Plugging in a new cable, regardless of its quality and price, to an audio system that we know well is a sort of trauma for the listener. In any case, it is for me. So far it has only happened a few times that I heard something better, something more appealing than my own interconnect being at that time part of my reference system (as that is our focus). It was true with the Acrolink 7N-AD6100, replaced by the 7N-AD6300 and then the Siltech Double Crown. The latter has yet to be beaten, not only in my system but also in several others owned by my friends and acquaintances who bought it. Of course, anything is possible, especially since there have recently appeared two new flagship series, more expensive than the current top ones, from the manufacturers that I respect on par with Acrolink: the Triple Crown from Siltech and Grand Evolution from Tara Labs. Transition to something better can shatter our peace of mind, because sooner or later it results in a purchase. Stepping down, in turn, presents us with a different kind of problem and instead of frowning at it we need to be as objective as possible about what and how much has changed, and what it means. The analysis, however, is usually carried out under the pressure of our desire to come back to our own cables. The anniversary Acrolink is something different still. It is not as good as the Siltech or – just to be clear – the Acrolink 7N-AD6300. Yet, on the one hand, it is enough different from the more expensive Acrolink and, on the other, similar in spirit to the Siltech that swapping the latter did not result in any discomfort and instead provoked me to further comparisons. I think that the most similar sonic aspect of the Speciale and the Double Crown is their tonality. It is not identical, and I’ll come back to the differences, but varies within a narrow range, so narrow in fact that it can be called the same "family." It also includes the Zero from Tara Labs. The Siltech and Acrolink, however, demonstrate a superior differentiation. The Tara is charming as hell and it's hard not to appreciate it, yet, at the same time, it brings everything to the same common denominator, showing beautiful, smooth and warm world for all. The new Acrolink interconnect could be classified as sitting right next to the Siltech while glancing in the Tara’s direction. Its tonal center is set fairly low, even lower than in the Dutch cable, a complete departure from the direction taken by Acrolink in its flagship 7N-DA6100 and 6300. To pick a closest match from the entire Acrolink product lineup, it would be probably the 8N-A2080III Evo. The Speciale offers beautifully saturated or even super-saturated colors and large, dense phantom images. Regardless of the album and the type of recording. For example, the vocals on the wonderful Tremors by Sohn (electronica and processed vocals) had a physically tangible "weight" that manifested in energizing the air in the room, in a large volume and in occupying a considerable space between the speakers. Something that is highly sought after both by music lovers putting their hope in vinyl and those into tube equipment. It would be a mistake, however, to define the sound as "tube" or "analog" in the sense of "vinyl-like". Its resolution and time coherence are well above average, and only a longer comparison against the Siltech shows what could be possibly improved. All other cables seem to sound slightly flat. You don’t actually need records produced with a particular care for midrange (vocals), although on Tremors mentioned above, Off The Record from Karl Bartos, Anita Lipnicka’s Vena Amoris and other albums the impression was truly electrifying. This deepening of the sound was clearly audible even on the recordings that hardly show a particular emphasize on anything, such as Miles Davis’s The Complete Birth Of The Cool, remastered by Mark Levinson. Bill Barber’s tuba finally sounded tight and deep where it usually tends to get lost, despite being an important part of the Davis’s band back then. The treble was thicker and warmer than with the Siltech but at the same time there was more of it. As a result, the sound was more open yet darker. Kind of a paradox. What’s worth paying extra to get the sound on the Double Crown level is primarily a better differentiation, soundstage and dynamics. The Acrolink brings the soundstage closer, pulling up distant layers and condensing the foreground and everything that’s directly in front of us. My reference interconnect easily reveals any differences in the soundstage setting, including mono recordings, showing not only the changes in the volume of a given instrument, but also in its size. The further the distance of the instrument from the microphone and the further it’s set in the mix, the quieter it sounds and the smaller its volume. I haven’t heard this kind of intuition in any other cable apart from the Siltech. The same applies to dynamics. The Acrolink looks at the world kind of through rose-colored glasses – perhaps an exaggeration, but still. It's a beautiful picture that manages to retain a lot of truth passed through a filter of sorts. Almost always, that involves rounded attack, decreased dynamics and reduced resolution, not to mention selectivity. The Siltech is superior to the Acrolink in all these aspects and that’s the way it should be. These are, however, not overwhelming or crushing differences. I would even venture to say that they are no more than moderately important and only so if we strive for the absolute, at any cost. Other cables that try to improve reality, in a similar vein to the Speciale, almost always fail in terms of the sonic aspects referred to above. But not so the Acrolink. This is where I see the reasons for the AcroJapan engineers’ decision to launch their anniversary cable at this price level. The Speciale in many respects sounds better than the flagship 6300, with the latter trumping it in terms of resolution and selectivity. But nothing more than that, and sacrificing body that is just insanely good in the anniversary interconnect. For some time now I have been looking for a cable that could worthily replace the interconnect linking my Ayon Audio Polaris III [Custom Version] preamp and Soulution 710 power amp. The easiest solution would be to buy another Siltech Double Crown.